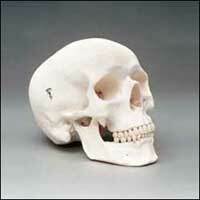 High quality plastic reproduction of a human skull that includes sutures, foramen and styloid processes. The calvarium is removable and the jaw is on springs. Dissects into 3 parts. Size: 5-1/2" x 8" x 6".